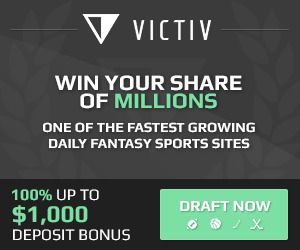 If you are new to the daily fantasy sports world or have never heard of a Guaranteed Prize Pool League, this article will help explain what they are and how they work. It will also give you some pointers to use when making a team and how a different strategy comes in to play when you are playing in these types of leagues. A Guaranteed Prize Pool League (GPP) is a large field tournament where the payouts and size of the tournament are locked regardless of how many players actually join the league. A quick example of a GPP league is one that costs $5 to enter with the capacity for 100 entrants. These leagues are referred to as guaranteed because even if the league doesn't fill, it will still run and the prize pool will remain the same. In the $5 example above, even if the league doesn't reach 100 entrants, the league will still run and the total prize pool will still be $500 no matter how many people actually joined. This is one of the unique features of a GPP that you don't see with other types of leagues and can often result in overlay which is always good for daily fantasy players. GPP entry fees can range anywhere from $2 and up, so regardless of whether you like to play in the smaller leagues or larger leagues, there will be GPP's that fit into your daily fantasy budget. As far as the amount of players in GPP's, that varies depending on the day and which fantasy site you play on. Draftkings is a great daily fantasy site that arguably puts out the best GPP's in the business. They run a ton of different GPP's every day that range from smaller fields (50 players) to larger fields (thousands of players). During the NFL season, they run a really cool league called "The Millionaire Maker" in which 1st plays pays a cool million bucks! As you can see from the payouts above, a GPP offers you the potential to win a lot more than you would if you were in a head to head league. GPP's are also nice because you don't have to win the league to make some money; all you have to do is place in top certain amount of spots. The difficult part of a GPP is that instead of competing against one other person, in this case you would be competing against 99 other people. So while the payouts are much higher, your odds of winning or placing in the money are a lot lower. As you can see, there are advantages and disadvantages of playing in GPP's. You can make a lot more money by winning a GPP than by winning a head to head league, but it is also a lot harder to do. So now the real question is how to make a team that will place in the money. From a strategic standpoint, playing in head to head leagues and GPP leagues are much different. When you're playing in a head to head league, you can afford to play it safe sometimes and pick a lot of players that you think are low risk, medium reward type of players because you only have to beat one opponent and you will win. On the other hand, in a GPP, depending on the size of the league, you might have to beat 249 other players. This should change your approach when making a team. In a GPP, taking fantasy players that are safe, low risk, low reward type of players isn't usually going to help you win a GPP. In order to do that, you need to take much bigger risks and hope that your players come through for you. If a certain player is really cheap and has the potential to have a big game, then take that player and hope for the best. In order to win GPP's, you have to take a lot of risks and you have to have a lot of luck. But if you are looking for more bang for your buck, this is the type of league for you.